Will ‘IHOb’ Publicity Stunt Expand IHOP Visits Beyond Breakfast? 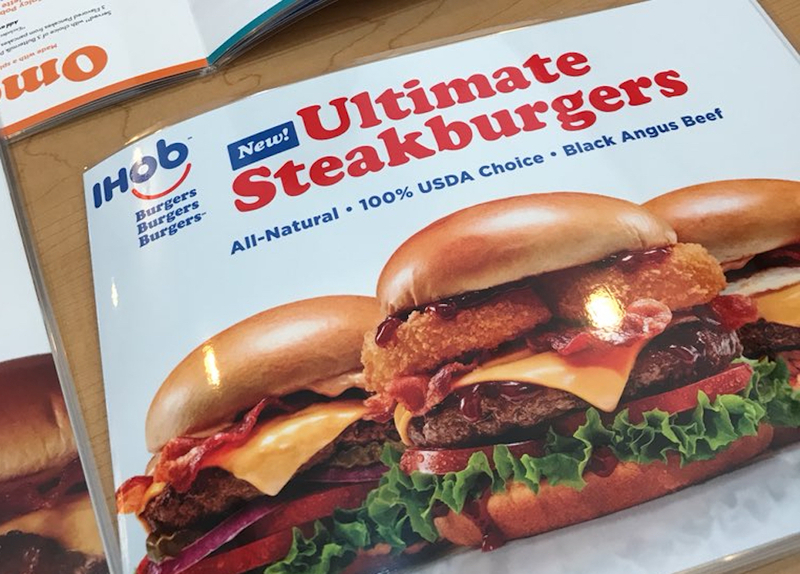 After teasing a fake name change to “IHOb,” which entailed a week of asking social media users to guess what the “b” stood for, IHOP’s Monday reveal of its new burger menu appeared to be tailor-made to drive attention on Twitter. As of Monday, IHOP said that 30,000 people speculating what the “b” might stand for, guessing everything from bacon to brunch to bananas. To demonstrate IHOP is as serious about burgers as it is about pancakes, it flipped the “p” to a “b” in their iconic name “for the time being,” including its Twitter handle. The promotion, crafted by agency Droga5, also has the flagship IHOP restaurant in Hollywood, CA, being “completely re-burgered.” Elsewhere, IHOP’s new “Ultimate Steakburgers” are available with unlimited fries and a drink starting at $6.99 at participating locations. 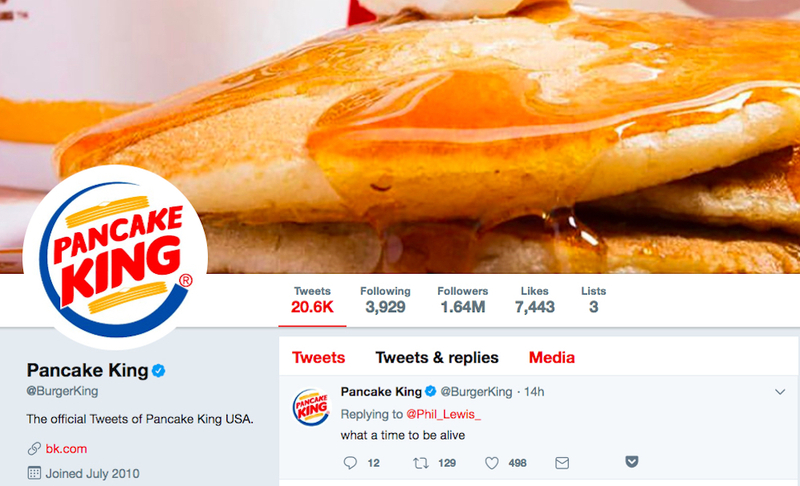 In the meantime, IHOP’s casual dining as well as QSR burger-centric rivals had some fun with counter-tweets, as Burger King rebranded its Twitter handle as Pancake King, while Whataburger posted a box of pancake mix on Instagram. Elsewhere, Wendy’s trolled IHOP with snarky comments like “Remember when you were like 7 and thought changing your name to Thunder BearSword would be super cool? Like that, but our cheeseburgers are still better.” The A&W Restaurant chain simply played up some consumers’ confusion about the whole thing. While it’s all fun, can the social media effort translate to actual visits for IHOP and generate interest beyond breakfast? “As it relates ‘IHOb,’ I will say that they’ve done a great job at creating anticipation for what it was all about,” says Bill McLaughlin, SVP Sales & Marketing at ShopAdvisor. “That was a well executed communication strategy. Let’s be truthful, the general public wasn’t talking about IHOP, but now they are. It’s interesting that they are still revealing details in pieces to keep the interest up. IHOP’s move represents the intensifying competition in all regions for consumers’ “share of stomach,” says Lee Zucker, Head of Industry/GM – Food Services for Yext (full disclosure: Yext owns GeoMarketing. More details on that relationship here), who ties it to a widening of the “QSR Breakfast Wars” over the past decade. Considering that social media has given deeper meaning to the ephemeral nature of marketing programs, the attention will die quickly. IHOP (or IHOb) will still need to be customers where and how they’re looking for information about restaurants, Zucker notes. “70 percent of consumers are searching for a cuisine type or food item, not by a restaurant name,” Zucker says. “How does IHOb guarantee that they’re appearing in search for ‘burgers near me’ or ‘lunch open now’ if those are the periods they’re optimizing for to attract diners? In a sense, IHOP’s promotion of its burger menu carries some risks. For one thing, it could dilute its strength as a breakfast specialist. Plus, as Zucker’s Yext colleague, David “Rev” Ciancio, director for Industry Insights, notes the burger space is already pretty crowded. “Shouldn’t they have gone with ‘bacon’ or the more obvious ‘breakfast?’ Those are great questions and ones that logically make sense given the brand’s space in the market place. It’s actually a really smart idea,” Ciancio says. In that sense, IHOb’s “b” not just “burgers.” The real message here is that the 60-year-old casual dining chain’s 1,400-plus U.S. locations wants to be known beyond breakfast. But the trick comes with making the idea stick long after IHOb campaign ends.